Duration of a game: 20 min. all in all: 5 min. of preparation and 15 min. of game. Up to 32 people play individually or in a team.Score a maximum of points by shooting at the others and of course avoiding being hit. 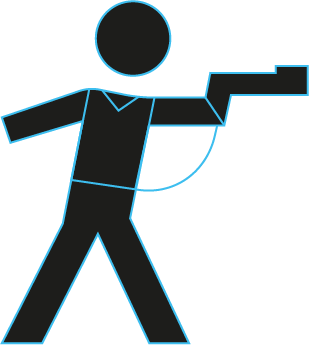 Disable your opponents by aiming with your laser gun on their electronic vests. It is above all a great team game. You will have to be creative and help each other to win! Play in semi-darkness with fluorescent decoration. Develop a strategy with your team, hide in nooks and crannies, wait for the right moment, aim and surprise your opponents. This game concept has been existing for over 20 years. It is harmless, painless and non-violent (EU standards). The Space Laser Game team insists on group experience, fun, team play. 4 safety rules: do not run, do not crawl, do not climb, do not jump. Anyone who does not respect the rules can be immediately excluded from the game. For birthdays, we group the children by age group (8-12 years) (14-16 years) so as not to unbalance the teams and maximize the gaming experience. Warning: Stromboscopic lights flash at the beginning of the game for 10 to 30 seconds, which can lead to an epileptic seizure. People affected by this disease can enter the labyrinth after the extinction of the flash and then play safely. The technology and equipment are constantly being improved by the Dutch Lasermaxx company. You gear up with a tech vest and a laser gun. The rifle has, as an extra feature, a small flashlight that allows you to illuminate spots in the darkness of the black light. Tip: put on dark clothes & sneakers. Do not dress up too heavily: you are soon going to feel pretty warm !